May 3, 2015 (LBO) – United States Secretary of State, John Kerry, has promised the government all possible assistance to continue its current process in the coming months and years, a statement said. “We respect and value your work,” Kerry was quoted saying when he paid a courtesy call on the President today at the Presidential Secretariat. Kerry had said States appreciates the steps taken by President Maithripala Sirisena to strengthen democracy and ensure transparency and accountability. 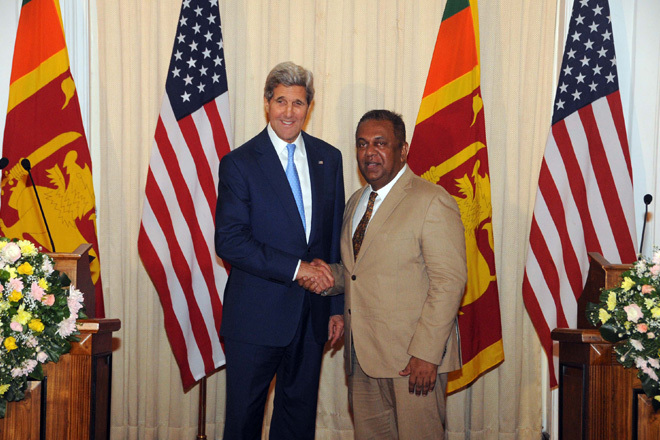 According to Kerry, the United States considers the close relations with Sri Lanka very important and proposed setting up of Annual Partnership Dialogue to ensure continuity of close partnership between the two countries in economic, trade, investment and other areas. Secretary of State also have inquired about Sri Lanka’s relations with India and China , and President had replied saying that Sri Lanka strictly follow a nonaligned foreign policy and said that his government would not allow the relations with one country to affect the relations with another country in any manner. “My government is determined to develop the country to raise the living standards of the people and we need the assistance of all countries, especially the developed countries for this endeavor,” President said. Kerry said he decided to visit Sri Lanka as a mark of endorsement of the policies undertaken by the new government and he would use the same reasons to try to convince President Obama to visit Sri Lanka, if possible next year before he completes his term. President Maithripala requested the US top look into the possibility of providing training facilities to officers of the Bribery and Corruption Commission, Police and Criminal Investigation Department officials probing corruption and frauds.